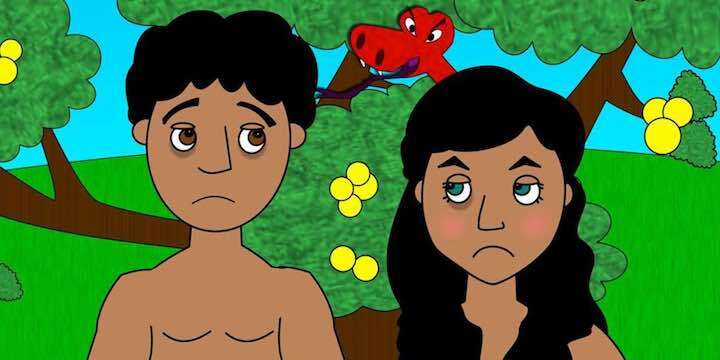 For some christians, and some critics too, Adam and Eve and the interpretation of chapters 1-3 of Genesis is a game-breaker. But I really don’t know why it should be. It seems to me that there is a perfectly reasonable and evidence-based way to look at this. What sort of story is Genesis 1? In approaching any piece of writing, it is wise to ask what is the genre and what the author was intending to communicate. Too often, christians and the sceptics who oppose them, assume they know that the author intended to write a narrative account of actual events. But why assume this? Even for a christian who thinks the Bible is “God’s word”, it isn’t necessarily the case that God could only reveal truth through historical record. I remember when I read Genesis as a young christian, it dawned on me that it didn’t read like an historical account. It read like a folk tale. I had read folk takes, myths and legends, for I had an interest in these writings when I was younger, and Genesis didn’t seem to be that much different – a talking animal, trees with strange properties (like being able to teach people about good and evil, and whose fruit could cause anyone who ate it to die), and fanciful explanations for the way things are (the reasons given to explain why men work hard and women have pain in childbirth didn’t seem too much different to a story explaining how the elephant got its trunk). So even for a long time while I found evolution too incredible to believe, I could see that Genesis was not factual narrative, whatever else it was. And scholars who know far more than I do have come to the same conclusion. They find similarities in the Bible’s creation and flood stories to other ancient near east stories that everyone recognises are not historical, although perhaps some elements of the stories might have some distant factual basis. Instead of trying to hold onto an understanding that doesn’t fit what we read, and is imposed on the text, I believe we should accept the text for what it clearly is. If it reads like a myth, and the scholars say it is a myth, then it very likely is a myth, or at least contains many mythical elements. If we start with an open mind, we can go where the evidence leads. Evolution is now scientifically well established. Critics argue over details, but in the main their dissent cannot be expressed in a scientific way that is believable to most scientists, nor to me. But if evolution is true, where could Adam and Eve fit in? The biggest killer for a literal Adam and Eve is genetics. Genetic science is now well established. Millions of people worldwide use it to resolve blanks in their family tree – not long ago I resolved the mystery of my maternal grandfather’s identity using DNA matching. It works! The science of genetics seems to have established quite clearly several matters important to discussion of Adam and Eve. DNA contains the biological instructions that control how our body grows, by providing code to make the different protein molecules which make up different parts of the body. Most of the DNA code will be the same for all humans, but some sections of the code (which specify individual characteristics such as hair or eye colour, height, facial shape, blood group, etc) will be different. DNA is composed of long chains of four main chemicals in pairs, which are copied each time a cell divides. There are almost 3 billion of these “base pairs” in the full human genome. Human DNA consists of 46 separate sections, grouped into 23 chromosome pairs. You can read a more detailed description at DNA, genes and human history. Copying is highly accurate, but it isn’t perfect, and so changes, or mutations, in the genome can occur each time a cell is copied. Most changes have little effect and are not passed on, but occasionally a mutation remains and is passed on to future generations. These rare mutations, and the differences between the genomes of different species, can be used to track the evolution of the human genome. When researching family history using DNA, there are two quite different aspects of DNA to be considered. We inherit our DNA from our parents – half of each of our chromosomes from each parent (and hence half of each parent’s chromosomes), approximately a quarter from each grandparent, and so on. But it seems to be random which parts of each chromosome pair we inherit, so while most of our DNA is common to all people, each child will have different DNA at the points which determine characteristics like hair and eye colour. The length of DNA segments that two people have in common is an indication of how closely they are related – i.e. how many generations in the past to their common ancestor from whom they inherited that segment. There are two parts of our DNA we only inherit from one parent – Y-DNA (which determines male gender and is only inherited from the father by male children) and mitochondrial DNA (which is inherited only from the mother). Thus there is very little variation in these forms of DNA from one generation to the next. Variation only occurs on the rare occasion when there is a mutation that is passed on. Here the closeness of relationships is indicated by the number of mutations they do or don’t have in common. Both these types of DNA information are relevant to evolution and Adam and Eve. It turns out that humans share a large percentage of our genome with other animal species, and more with the great apes (chimpanzees, gorillas and orangutans), the species closest to us in evolution. Depending on how it is measured, human and chimp DNA is 95% to 98% identical. This commonality supports the conclusion that humans and the great apes evolved from a common ancestor population, just as in human genealogy. It is possible that God created these species individually with similar genomes, but we would have to say God has made it look as if we are all related, and we don’t use this explanation in human genealogy. Mutations are relatively rare, so it is statistically unlikely that the same mutation would occur independently in two different species, or that it would be reversed. Thus if mutations are mapped, they give an indication of how species have evolved. For example, some mutations are common between humans, chimpanzees, gorillas and orangutans, and so occurred early in these species’ evolution. But other mutations are not found in orangutans but are found in the other three. Others are only found in humans and chimpanzees, and so on. This indicates the order in which the different species separated from others in the family tree, just as it does in human genealogy. It turns out that the order is orangutan first, then gorilla, chimpanzee and human. I suppose it is possible that God could have created these species with varying mutations in common, but we don’t consider this possibility in genetic genealogy, and again we’d have to say that God has made it look as if these species evolved from common ancestors. A population needs genetic diversity to survive disease, because any disease will affect some individuals less than others, and these will then survive and continue the species. If a population is reduced in numbers, its genetic diversity suffers. It will take time, determined by how quickly mutations occur, for genetic diversity to recover from this “bottleneck”. Using observed rates of mutation and the number of variants in the current population, scientists can calculate the approximate size of any population in the past. Using this method, it has been calculated that the ancestral population for humans was around 10,000. To reach the current diversity from an ancestral pair wouldn’t be possible without amazingly high mutation rates; impossibly high if that couple lived only 6,000 to 10,000 years ago. When a child is conceived, it receives DNA from each parent. Both parents have two strands of DNA in each chromosome, and the child will receive its DNA from one of these strands until a “crossover event” occurs, and it starts to receive DNA from the other strand. The frequency of crossover events can be measured, allowing the time back to a common ancestor to be determined and an estimation made of the ancestral population at any time in the past. Based on millions of these calculations on each chromosome again calculate the ancestral human population of 7,000 to 10,000. Mathematical models have been built for the genetic variation among the four great apes. This modelling shows that the common ancestral populations of humans and chimpanzees, and also of humans, chimpanzees and gorillas, was about 50,000, and the smallest ancestral population was that of humans alone, supporting the previous estimates of about 10,000. The same genetic studies show that every human being alive has a single woman (nicknamed Mitochondrial Eve) as one of their millions of ancestors and a single man (nicknamed Y-chromosome Adam) as another of their ancestors. But these two individuals almost certainly lived at different times and were not, of course’ our sole ancestors, for there were thousands of other men and women alive at the same time, and many of these were our ancestors as well. It is just that these are the only two who have a part in every one of our family trees. So we can say …. Thus genetic science shows that the present genetic diversity of the human race wouldn’t have been possible unless we are all descended, not from one solitary couple, but from a population of several thousand. The only way around this evidence is to claim that God created new DNA as some early descendants of Adam and Eve were conceived, rather than use the DNA the two parents provided. That would really be akin to a person whose clothing was covered in a murdered person’s blood “explaining” it by suggesting that maybe God created the blood. We wouldn’t accept an explanation like that in a murder case, so it is hard to see why we should accept it in science. DNA evidence indicates that humans descend from a large population because we, as a species, are so genetically diverse in the present day that a large ancestral population is needed to transmit that diversity to us. These two facts (Genesis reads like a myth, and Adam and Eve couldn’t have been the progenitors of the human race) make it abundantly clear that the story is mythical. This is nothing for christians to be worried about, nor for sceptics to feel excited about. The Bible contains history, poetry, parables and other stories, even songs, and scholars can tell us generally which parts are which. Seeing Genesis as myth doesn’t reflect badly on the historical sections, and doesn’t mean the Bible couldn’t communicate truth from God. It just means its communication is in several different genres. According to Scott McKnight (see reference below) there is a history of Jewish non-literal interpretation of Genesis 1-3 in the centuries just before and after the New Testament was written, which makes it reasonable to think that Jesus and the New Testament writers may have not been taking a totally literal view either. So what useful things does Genesis 1 tell us? Scholars tell us that while the creation story has similarities to other ancient creation stories, it also has differences. Other stories portray the world being created out of some argument among the gods, with humans created to serve the gods as servants. But Genesis tells of the world being created by a single creator God who gave the human race the dignity of creating them in his own image, however we might understand that. The stories have some similarities, but the philosophy or theology behind them is very, very different. We can also say that the story doesn’t teach the idea of original sin, as it is often understood, and it being the cause of death. There was animal death before humans ever came on the scene, and each of us has done enough that needs forgiveness without blaming Adam! Christians don’t need to defend Genesis 1-3, it stands as a myth that teaches some important truths. Sceptics don’t have to attack Genesis 1-3, they can accept it as a myth which tells theological ideas they can understand even though they don’t believe them. There really shouldn’t be much to discuss now. There really are other differences that can be debated more profitably.